The Cuisinart ICE-31 is a unique paddle crushes and freezes chunks of fresh, ripe fruit to create one and a half quarts of delicious frozen fruit treats – from chunky textured to creamy smooth. A second paddle easily turns the unit into a genuine Cuisinart® Ice Cream & Frozen Yogurt maker. Add your favorite fruit, ice cream, yogurt mixtures, and flavorings using the large spout on top to create endless varieties of frozen desserts and drinks in 18 to 25 minutes. Healthy, nondairy, fresh and fruity to totally rich, creamy, and decadent, this dessert maker does it all and you get to control the ingredients. The Cuisinart Fruit Scoop Frozen Dessert Maker has many exciting features for users of all types. You can extend the lifetime of your Cuisinart Fruit Scoop Frozen Dessert Maker with the purchase of a FactoryOutletStore Factory Protection Plan. 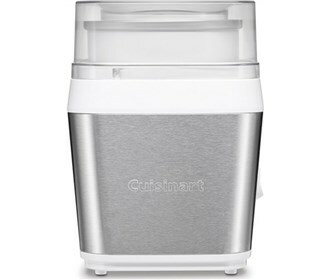 See the Cuisinart Fruit Scoop Frozen Dessert Maker gallery images above for more product views. 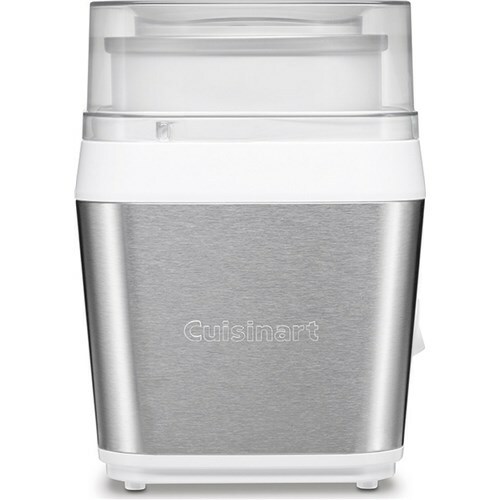 The Cuisinart Fruit Scoop Frozen Dessert Maker is sold as a Brand New Unopened Item.